Following the successful launch of Es’hail-2, the new Es’hailSat teleport will be inaugurated on 14 February 2019. This will also be the occasion to officially put the two amateur radio transponders of Qatar OSCAR-100, the first geostationary P4-A satellite from Qatar, into operation. The opening ceremony will be held by His Excellency Abdullah bin Hamad Al Attiyah, former Deputy Prime Minister of Qatar. A71AU is also the chairman of the Qatar Amateur Radio Society (QARS) and initiator of the first Qatari amateur radio satellite. A team of the P4-A team of AMSAT-DL, consisting of the chairman Peter Gülzow DB2OS, Achim Vollhardt DH2VA and Thomas Kleffel DG5NGI, is on its way to Qatar to set up and commission the P4-A ground segment at the ground station of Es’hailSat. In addition to LEILA and the DVB-S2 DATV system, this also includes a club station for SSB radio operation under the callsign A71A. A backup station is installed at QARS in Doha. The ground station of the AMSAT-DL at the observatory Bochum is also ready for reception and transmission. Later, radio operation via Qatar-OSCAR 100 will also be carried out here under the callsign DL50AMSAT. Only after the official release ceremony on 14 February will the transponders be released for general radio operation by radio amateurs worldwide. During commissioning, we expressly request that you refrain from any transmission attempts! 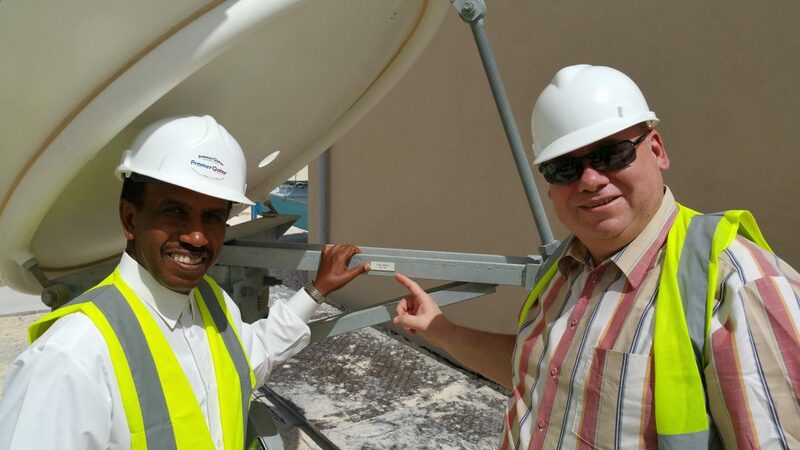 The SCC in Qatar, as well as Bochum in Germany, are carrying out some tests to measure both transponders and to calibrate the ground systems. Please also note the beacons sent in the NB transponder. On the DATV beacon of the WB Transponder a video of Es’hail-2 will be broadcast in an endless loop in DVB-S2 format on the opening day. Furthermore, the rules of the game, as defined in the Operating Guidelines for the NB transponder and WB transponder are formulated. Please observe the band boundaries of the NB transponder as defined by the upper and lower beacon! A later adaptation and possible extension upwards may be considered after first experiments. Again: Please no uplink attempts until the official release of the transponders by QARS! We appeal to patience and to the Ham Spirit: any disruptions during commissioning and on the opening day could result in further postponements of the official release.